Eureka Springs, it is no wonder this small town is the best place to vacation for a family. It isn’t a movie set but it has more characters than a storybook. It is a fun, fantastic, funky place to visit and kids love it. 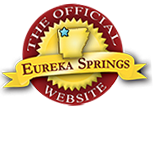 Introduce your kids to Eureka Springs and become the “sick” parents (If you don’t know what that means…look it up now in urban dictionary and impress later). 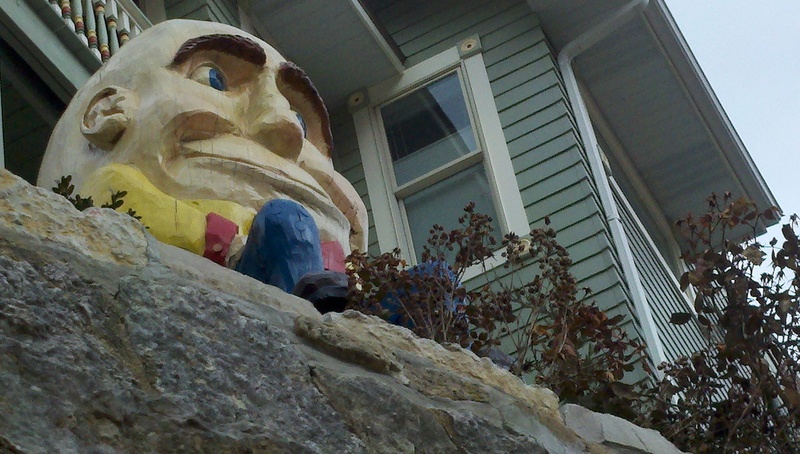 Find Humpty Dumpty sitting in downtown Eureka Springs and discover more roadside attractions in unexpected places. Christ of the Ozarks-this 7 story tall Jesus Christ watches over the town of Eureka. Built completely by hand in 1966 by the late Emmet Sullivan, one of the artisans who sculpted Mount Rushmore. No poured segments were used in the statue’s construction. At an altitude of 1500 feet, the statue is made of 24 layers of white mortar on a steel frame and weighs over two million pounds. The foundation is virtually welded into the rock of the mountain made of 340 tons of concrete interlaced with steel. Also of interest and located near the Christ of the Ozarks is #1 attended, inspiring, and unforgettable outdoor drama of The Great Passion Play. Located in the Passion Play complex off of Passion Play Road. Humpty Dumpty- he is sitting on a wall in the middle of historic downtown Eureka Springs. The kids will want a picture with him but you will have to be careful. You wouldn’t want him to fall. You can see Humpty Dumpty sitting up above you from Spring and Main Streets in downtown Eureka Springs on a wall next to the Basin Spring Park. World’s Largest Tuned Wind Chime– this 36 foot tall, musically tuned wind chime hangs in a 100 year old oak tree. Listed in the Guinness Book of World Records, its chime can not only be heard for miles, you can actually feel its vibrations. Located mile south of HWY 62, on HWY 23 S, in Eureka Springs. Dinosaur World-Said to be the largest dinosaur park in the world is now closed but largely still intact so some of the dinosaur sculptures and the entrance can be seen from the road. Dinosaur World, also known as John Agar’s Land of Kong, was a 65 acre theme park containing a hundred life-size sculptures of dinosaurs, cavemen, and other prehistoric creatures. Located in Beaver, Arkansas. Idea: take photos of the kids in front of the roadside attractions and let them create a little scrapbook or start a new tradition. Make a point to find roadside attractions in every town you pass through. The Roadside America website will get you started. You can even claim new ones you’ve uncovered (last time I checked…Humpty Dumpty was not on the website). Lions, tigers, and bears….really. Turpentine Creek is a lifetime refuge for abandoned, abused, and neglected big cats. Personal guided tours and the Education Center give kids hands-on opportunities to feel real big cat fur, whiskers, toys, and more but feeding time at Turpentine Creek is an event not to be missed. Every day, interns prepare and feed over 1000 pounds of meat (mostly chicken, thanks to the generosity of Tyson Foods). Kids experience the true power of these big cats; hear the low growl of the tigers, high pitched screams of the cougars, and caroling of the lions. Relive the Wild West. 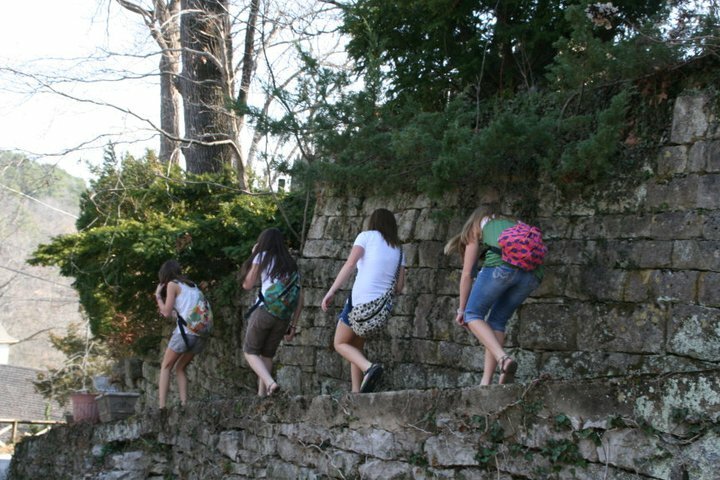 Go Downtown-n-Underground as this mildly adventurous tour takes you to the rarely seen, secret underground city of Eureka Springs. You will discover civil war caves and visit the place where Bill Doolin, member of the infamous Wild West Dalton gang, was captured by U.S. Marshalls. Get details and online tickets here on ReserveEureka.com. Tour begins in Basin Spring Park in downtown Eureka Springs. If you visit Eureka Springs at the right time of year, you might see a bank robbery…or at least the recreation of the bank robbery of 1922. Read more about the bank robbery here or visit the Official Eureka Springs Calendar of Events to see if it is happening in the weekend you are visiting. Find Ghost Adventures. I’m not talking about the Ghost Adventures show on TV…I’m talking about real ghost adventures (view excerpts from paranormal investigations featured on TAPS and Biography Channel’s My Ghost Story). The Crescent Hotel is known as America’s Most Haunted Hotel for nothing. Take the tour and learn about the hotels past guests who checked in and never left. The Crescent Hotel was built in 1886 and is one of the prestigious Historic Hotels of America recognized by The National Trust. Worried about ghosts interfering with a good night’s sleep? Don’t worry..they have a ghost free zone. Located at 75 Prospect Avenue in Eureka Springs. There is more…so much more. With 4 lakes and 3 rivers and dozens of natural springs there are a lot of water adventures to be had. Rent a ski or pontoon boat and navigate Beaver Lake or Table Rock Lake. Paddle around in Lake Leatherwood or enjoy beautiful Black Bass Lake. Canoe or kayak the White River, Kings River or the Buffalo National River. There are many vacation destinations but some of the best family vacations happen in Eureka Springs Arkansas. Visit EurekaSprings.com for more information and find Online tickets for your Epic Adventures online at ReserveEureka.com. This entry was posted on May 16, 2011 by estcblog in Basin Park Hotel, Crescent Hotel, Fun Downtown, The Great Outdoors.